The Xiaomi Mi MIX is a device of great dimensions and well differentiated from the competition, but if anyone still had doubts about this product, perhaps in relation to the colors, some new photos represent more options available, one in white and another version reduced in size with respect to the original version. The Chinese company would have decided to reach all those who do not look for an above-average size in smartphones, and so would have launched a new smaller model, called Xiaomi Mi MIX Nano. Here we talk about both news. It is becoming more obvious that Xiaomi does not seem to have enough, and after presenting four devices in recent weeks (Xiaomi Mi Note 2, Xiaomi Mi MIX, Xiaomi Redmi 4 and Xiaomi Redmi 4A), is already prepared to introduce a new device. The price? Around 2,999 yuan, which at the current exchange rate would correspond to approximately 450 dollars. The rumor of this new smartphone is due to images that, in practice, confirm the existence of the device, and whose appearance is clearly similar to the Xiaomi Mi MIX. Even so, we have to wait for official confirmation or the appearance of new rumors, crucial to know at what exact time of 2016 we can put a new smartphone under the Christmas tree, either in the nano or white version (which obviously should appear in the market at the same time as the rest). As for the technical specifications, and always according to the latest rumors, the next Android cell phone by Xiaomi will be almost identical to the current model, showing once again as a device without edges and with a screen bordered with a ceramic body, but with dimensions significantly reduced. With this size reduction obviously the screen will be smaller and probably 5.5 inches with Full HD resolution. The processor will be the same as in the larger version (a Snapdragon 821), while the RAM is 4 GB (a difference from the 6 GB RAM in the Xioami Mi MIX of 6.4 inches). Even the internal storage would be reduced slightly, from 128 GB to 64 GB. 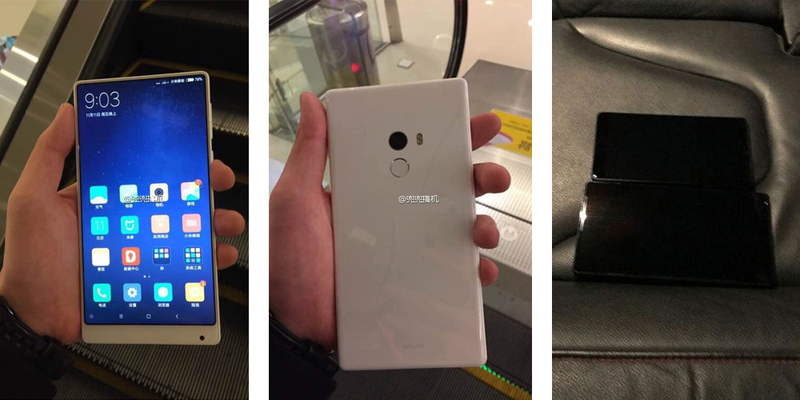 In short, several photos starring the new Xiaomi Mi MIX, some with white case and another photo that would demonstrate the existence of a nano version. In both cases, they are expected to hit the market for the Christmas period. Too bad we will not have the opportunity to officially see it on the European market.